Sometimes, no matter how much you diet and exercise, getting the body shape you want is problematic. Some areas of the body simply don’t respond well to diet and exercise. So if you want to contour your body, you need to look at other solutions. One of the best solutions may be a combination of liposculpture and liposuction. Liposculpture & liposuction are safe and simple procedures that gently reshape your body. Liposculpture and liposuction remove excess fat from the thighs, buttocks, abdomen, waistline, arms, knees, ankles, calves, cheeks, jowls, and neck. Traditional liposuction uses lager cannulas while liposculpture is gentler than traditional liposuction as micro-cannulas (small, thin, hollow instruments) provide for more precise sculpting. Developed in 1985 by dermatologic surgeon, tumescent liposculpture relies on tumescent fluid to numb the fat as well as help liquefy it, which allows for removal through small cannulas. A micro-cannula is inserted through a tiny incision in an inconspicuous location, and unwanted fat is then removed by high-pressure vacuum. Not only are your results more even with this technique, but it also allows for faster recovery. You will be able to return to work 2-3 days later and can start working out soon thereafter. Another advantage is that liposculpture can be done purely under local anesthesia if desired, which eliminates the risks associated with general anesthesia and sedation. 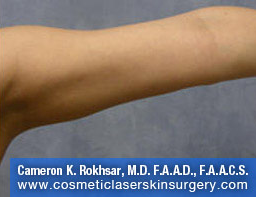 Click here to read Dr. Rokhsar’s article on Tumescent Liposuction at Emedicine.com. 55 years old female came for consultation complaining about her excessive fat around her neck (turkey neck) and double chin. Liposuction was performed and the results were exceeded her expectations. 45 years old underwent tumescent liposuction and laser liposuction for fat removal in love handles and abdomen. When Should Liposuction Be Used? While liposculpture and liposuction are not the answer to obesity, they can help you lose inches from undesirable places. By reshaping your body and reducing problem areas, you will look slimmer and fit better in your clothes. Age by itself is not a significant factor in who can benefit from this procedure. Dr. Rokhsar has treated patients in their twenties to patients in their seventies with this technique. One of the most impressive aspects of tumescent liposculpture is that the skin quality is not altered by the micro-cannulas. 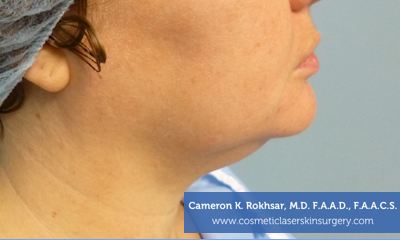 The skin is a dynamic organ which has elasticity and, in most cases, shrinks to accommodate the new body contour. 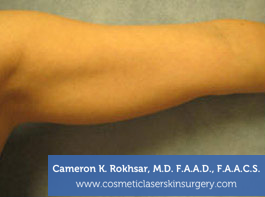 Therefore, there is no need to remove excess skin with surgery. We refer to this procedure as “liposculpture” because new techniques allow Dr. Rokhsar far more flexibility and control than ever before. He can, therefore, more easily blend in your new results and your desired loss with your current body type. In other words, Dr. Rokhsar can help you remove fat from the areas you don’t want it, but keep it around where it suits your desired results. This helps patients achieve a much more naturalistic looking final result, meaning that most people who see you will probably just assume you’ve lost weight the natural way. If you’re interested in this procedure. 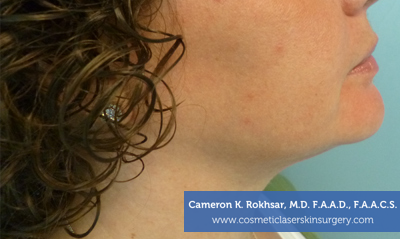 contact Dr. Rokhsar to get started right away. What parts of the body can benefit from liposculpture? The stomach, thigh, buttocks, waist, hips, flanks (love handles), arms, knees, outer thighs (saddle bags), faee, neck and breasts are some of the various places that liposculpture can treat. Individuals seeking fat reduction because they are unable to affect those exercise resistant pockets of fat and want to minimize their downtime will find great success with this procedure. How is the liposculpture procedure performed? 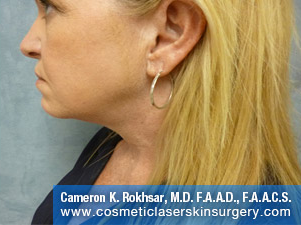 During the procedure, Dr. Cameron Rokhsar Dr. Rokhsar will use a liposculpture machine to first soften the fat tissue. Once the fat cells are dislodged using the ultrasound technology, they are removed using small instruments that are inserted through tiny cannulas made into the treatment site. 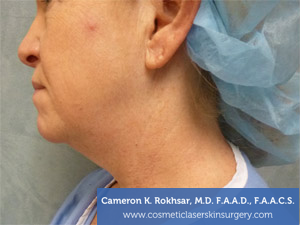 The very small openings result in virtually no scarring and the final result is fully realized two months post treatment.